We offer you accommodation in five comfortable suites. The guesthouse can accommodate up to 18 guests on regular beds and 9 guests on extra beds. There are two two-bed suites, two four-bed suites and one six-bed suite. In all suites, there is a kitchenette with a dining table and chairs. The kitchenettes are equipped with a hob, a microwave, a kettle and all the necessary dishes. The bathrooms have a shower. The largest six-bed suite has a spacious main room with a sofa and a TV set, the kitchen is equipped also with a dishwasher and an oven, and the bathroom has a bathtub. Suite 1 is situated in the ground floor, and is suitable for our handicapped guests. 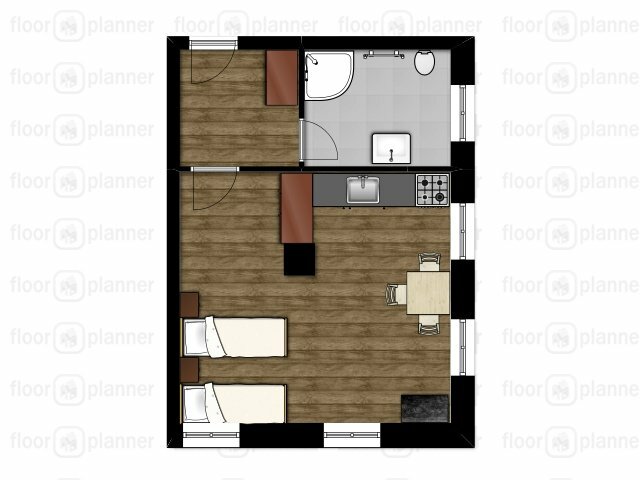 There is a double bed behind a divider in the main room. 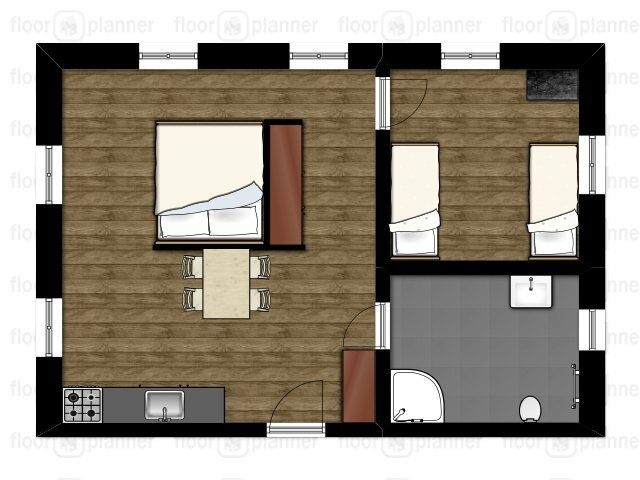 Two beds can be found in a separate bedroom. The dining table and the chairs are copies of the original furniture, the light above the dining table is original! 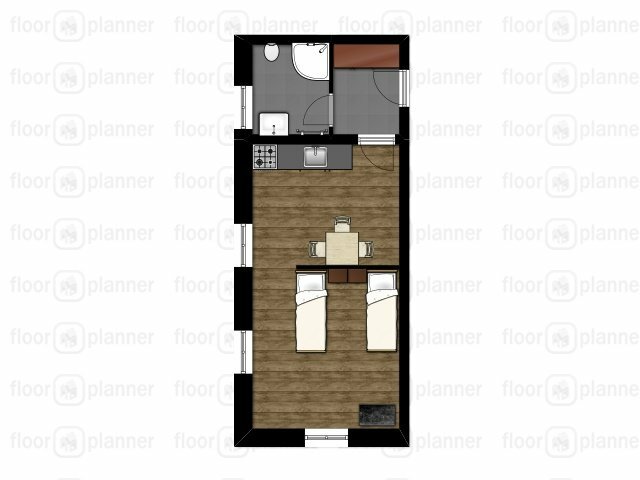 This two-bed suite has two beds in the main room. There is enough room for two extra beds, or 1 extra bed and a cot. The view shows you the dam of the former pond. There are two beds behind the divider in the main room. The suite can accommodate guests on 1 extra bed and 1 cot. 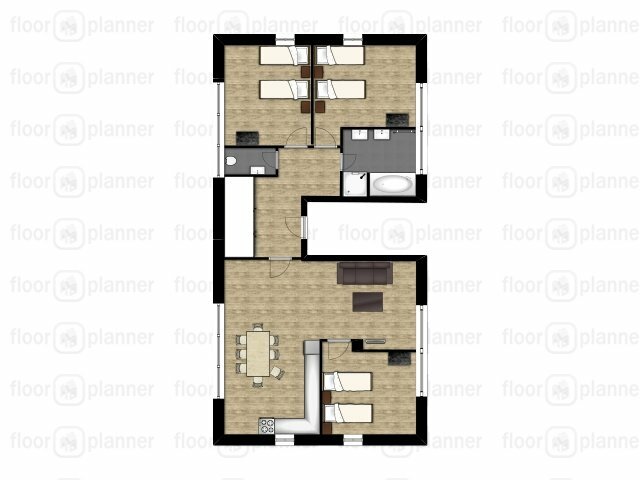 There are two separate bedrooms, each with two beds, and the main room. The larger bedroom, which has a view towards the forest and the dam of the former pond, provides space for two extra beds. Enjoy the view towards the village Horní Čermná while working in the kitchenette! It provides accommodation in three separate bedrooms, each with two beds. 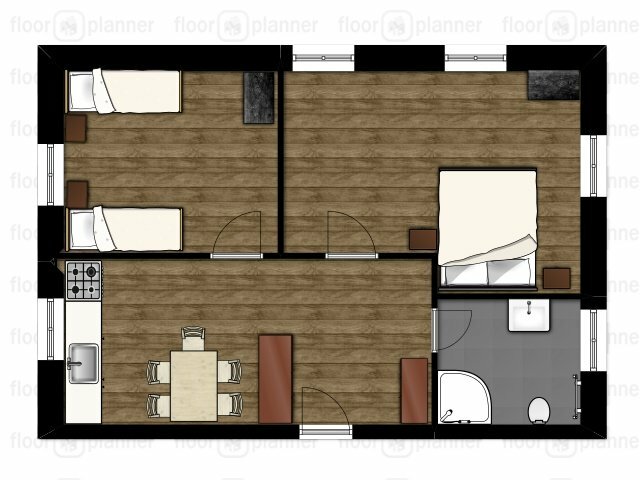 There is enough room for an extra bed in each bedroom. Altogether, there is a potential for 5 extra beds in the suite. The spacious main room has a folding sofa and a TV set. The kitchen is equipped also with a dishwasher and an oven. There is a bathtub and a shower in the bathroom. The toilet is situated in a separate room.